Last weekend, Doors Open Denver, an annual event that celebrates architecture and design took place. Buildings throughout the Denver area opened their doors to the public for the purpose of browsing through, gawking at, absorbing, experiencing and celebrating the beauty of architecture. The modern architecture of TAXI, located north of Denver. The picture shows TAXI 2, the newly built structure. This year’s theme was modernism. One of the sites that I visited was TAXI. 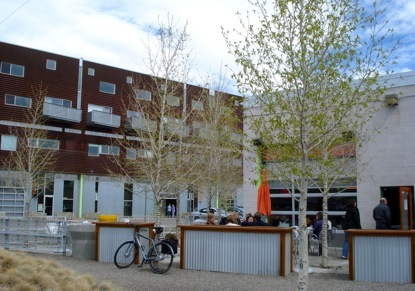 TAXI is a revamped mixed-use community located north of Denver. While it does not have passive solar elements, the redesign of the buildings and grounds does have some cool community aspects, like an organic garden and bicycle share, while the buildings boast higher efficiency as well as a modern aesthetic in its design. There are currently 3 main buildings on the property, with two of the buildings being revamped or ‘recycled’ from their former use as a taxi depot and freight warehouse. They have now been incorporated into a community that includes work/office spaces, residential living areas, galleries, restaurants and a school. While there are plans to expand, TAXI, TAXI 2 and Freight currently comprise the main buildings of the TAXI community. The former Taxi depot now features the restaurant Fuel, with other office space inside. TAXI is named after its former use as a Yellow Cab depot. It has now been transformed into a modern residential and mixed-use property including offices and the restaurant Fuel. Diners can eat fresh, local, organic food on the outside patio of the restaurant while enjoying the warmer springtime weather. 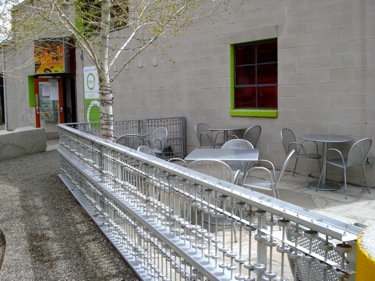 Notice how former practical elements – like the conveyor belt – now fence, have been recycled and blend into the new restaurant environment. There is a garden space outside of TAXI 2. The restaurant Fuel grows some of the organic food for its recipes here. These types of mixed use living communities often include the conveniences of stand-alone home living, while they are more efficient because of combining places for work and living under one roof (heating and cooling costs are shared) and having places for socialization all within easy walking distance. The newer complexes also boast better design than most of their urban counterparts. 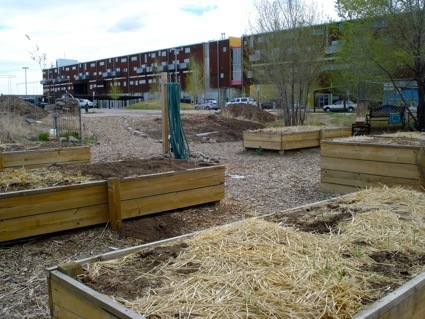 Opposed to living in the city within a cramped apartment complex with little access to growing food and digging in the dirt, this mixed-use community incorporates an organic, raised garden in the back. At the time of the writing it is springtime, so the soil is being prepped. Part of the Taxi development, a former mid-center freight center has become modern office space. The third building is Freight. 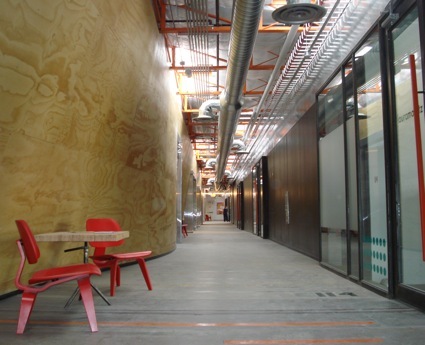 It was a former freight terminal that has been converted into modern office spaces. While the finishing touches are still being done on the east side of the building, it is almost fully occupied with various businesses, along with a school. Inside of Freight, the high ceiling shows the duct and electrical work, while skylights let in natural light. While they are mix of both old and new, both the repurposed buildings, TAXI 1 and Freight, both have a lightened, airy feel, while maintaining a sturdy sense of self. When looking up toward the high ceiling, one sees exposed duct work and electrical wiring, yet this seems within the context of the modernism of the design. Natural light enters through the skylights and the large glass doors, creating a very natural feeling, as opposed to the rectangular particle board – dropped ceilings and the greenish fluorescent office lighting of the 70s and 80s. While there are traces of its former incarnation as a freight loading building, they blend seamlessly with its newer self. For example, the cement floor has been preserved in both buildings, giving them a clean, vacuous feel. 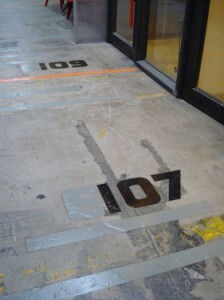 Stenciled office numbers have been placed on the floor. When looking down, the blemishes and scratches on the floor are like a beauty marks, giving the building character. 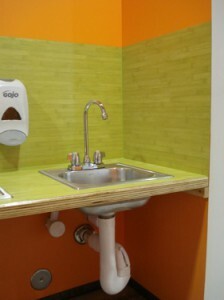 More sustainable types of design elements, such as the bamboo paneling around the sink have been incorporated into the building. More sustainable, than say, a petroleum-based product like vinyl, because bamboo can be more quickly grown (couple of years) than petroleum (thousands of years) can be produced. Taxi residents have use of bicycles that can be taken out for a 12 minute ride along the river path into Denver. 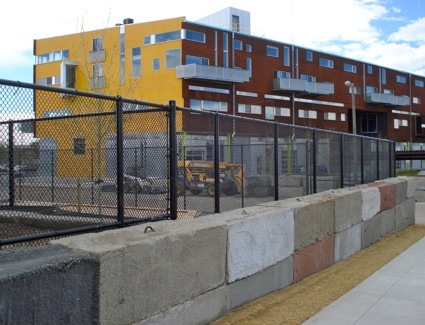 This modern, well-designed community complex is located north of Denver in the RiNo district. The city of Denver is easily accessible by a bike path next to the the Platte River or by driving a few miles into downtown Denver. 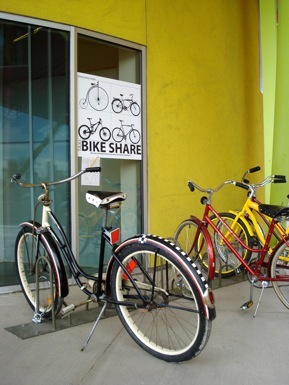 Reconditioned bicycles can be used by all the residents of TAXI. All that a person needs to do is sign out the bike and return it upon getting back. Restaurant patrons are eating on the patio. The residential and business building Taxi2 is to the left. Fuel restaurant patrons are dining on the patio outside of the former taxi depot, the lighter colored TAXI 1, while TAXI 2, is the mixed use building to the left. TAXI 2 has two floors of office space and is topped by residential apartments on the upper floors. The TAXI development recently received the American Institute of Architects Design Honor Award. Keya Lea likes to spend time outside, enjoying the sun. Hi! I’m interested in Taxi as a living/work space – will be visiting at the end of the month and would love a tour! To arrange a tour, it would be best to get in touch with Taxi directly. Their phone number is listed through the link. I only visited there, but it looks like a great place to live.